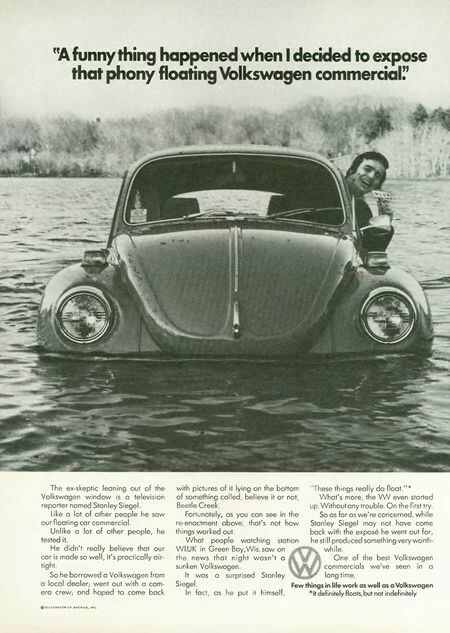 Years ago Volkswagon used to air commercials for their VW Beetle saying that they would float in water. One journalist tested that, sure in his thought that it was false advertising. But as it turned out…the orginal Beetle did indeed float. Of course you couldn’t DRIVE it in the water, but that’s beside the point. 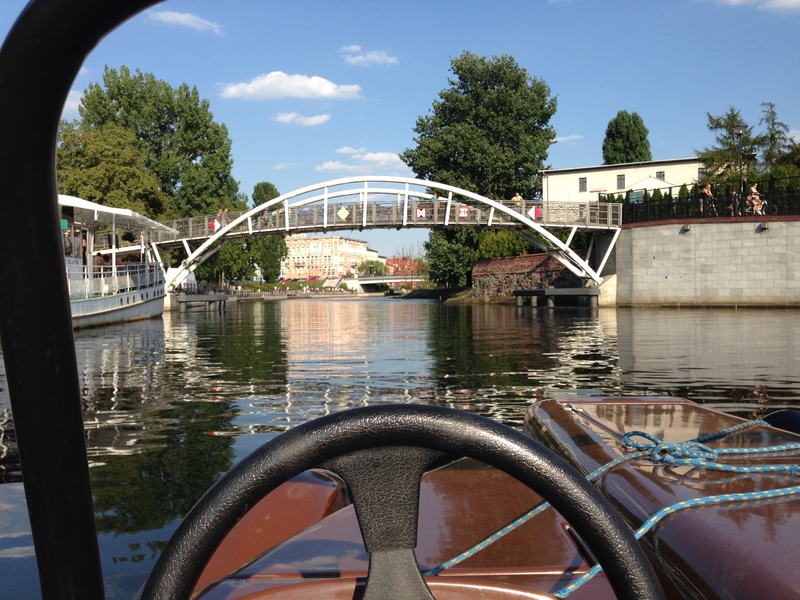 Bydgoszcz DOES have “cars” that drive on the water and we took advantage of a few beautiful days to do a test drive. The first time we went, all the “motor” cars were in use and instead of waiting more than an hour we opted for the one paddle-boat car they had available. 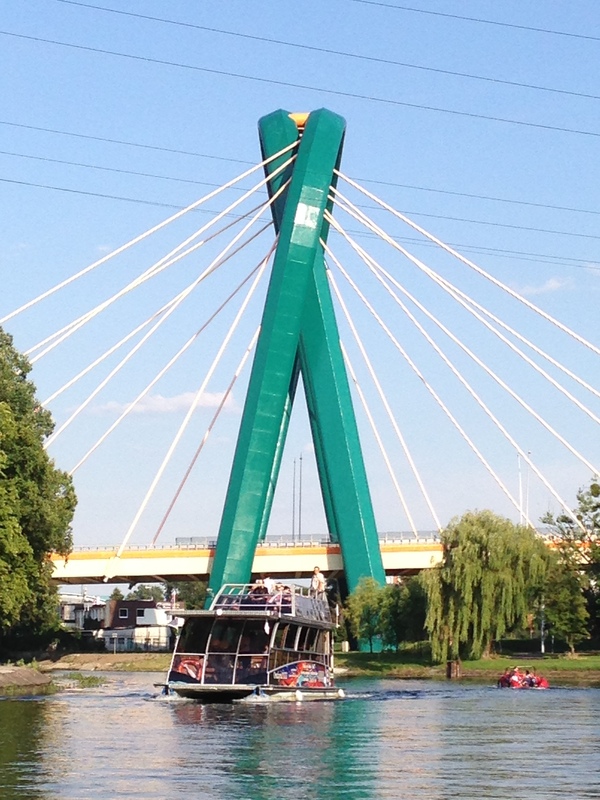 It was exercise….serious leg exercise… paddling our way up and down the Brda River. If you keep up a steady rhythm of paddling, it’s a nice way to get a different view of the city. But it’s not all that leisurely and relaxing. First, because if you don’t paddle, you don’t go anywhere, and second if it’s one of the hottest days of summer, when you get off after an hour of paddling, wearing a life jacket (required) and in the sun….you’re shirt is wet and sticking to you. Plus, it’s slow. 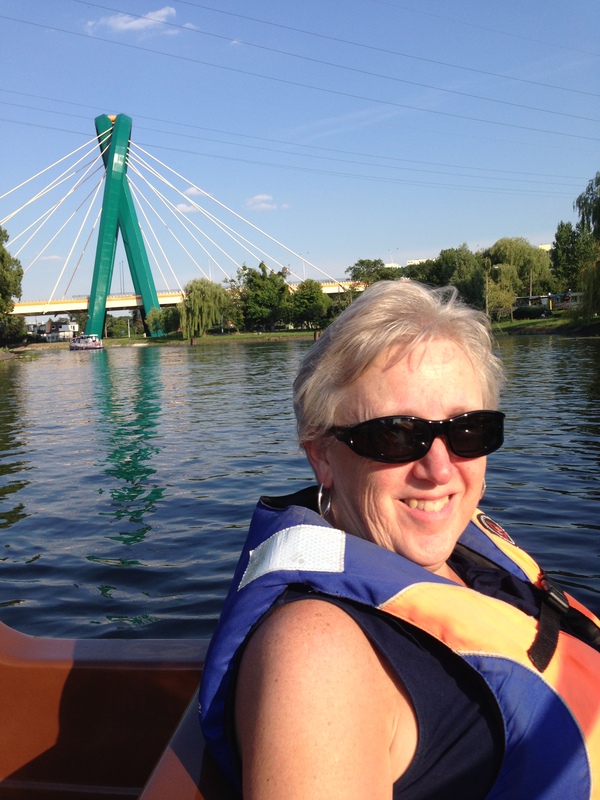 We were overtaken by a larger tour boat, a smaller private boat and one of the motorized cars that can be rented. It was hot that day…and it was work. So although the views were great, it wasn’t as much fun as it could be. So a few days later, we returned and rented a blue police car (with a motor!). 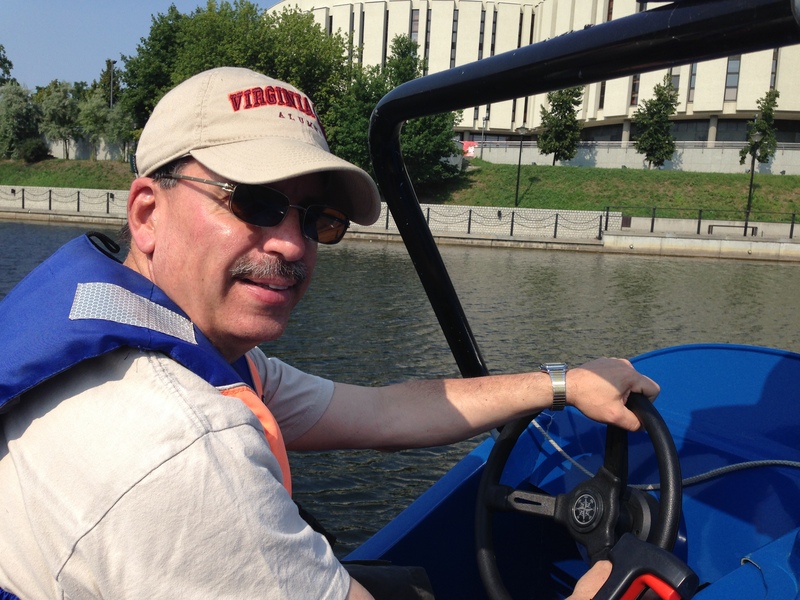 Here’s David at the wheel with the Opera Nova in the background. 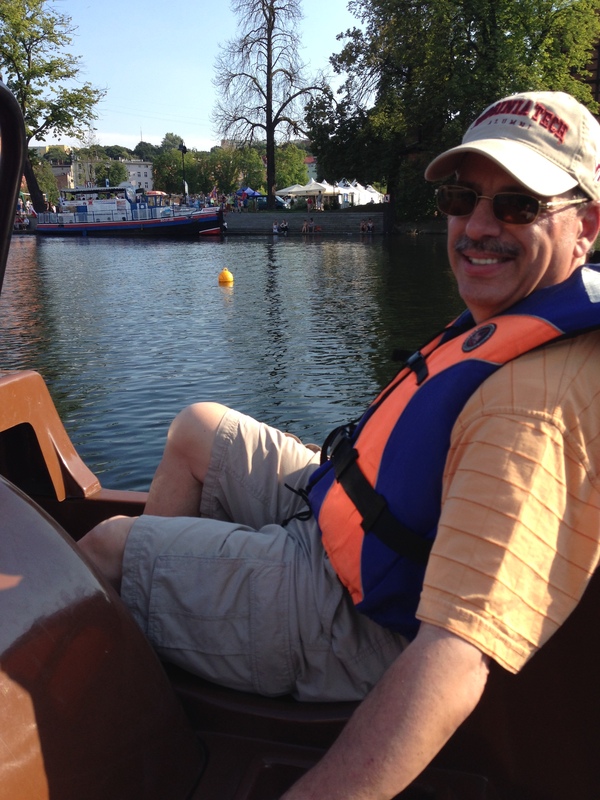 Vroom, Vroom….it was much faster due to the small motor. And because we had more speed, we were able to go even farther up the river before we had to turn back. 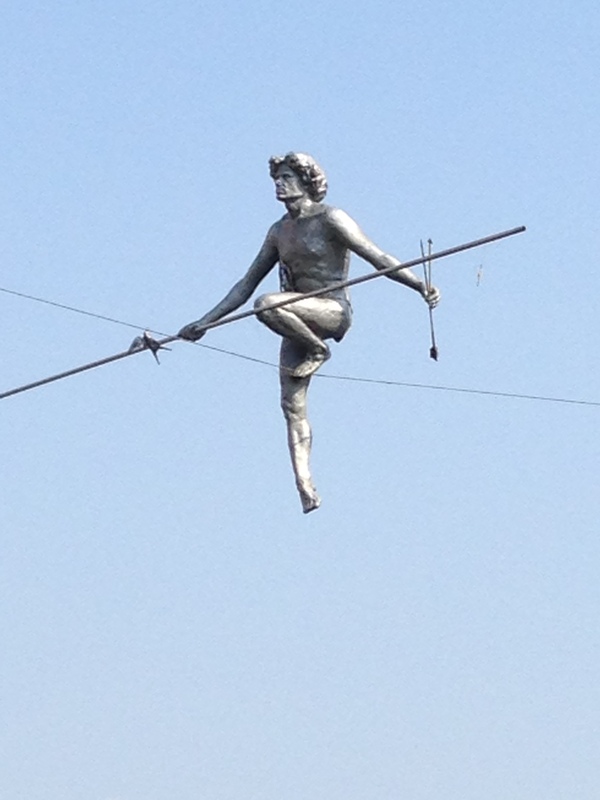 This is the “Man Crossing the River” statue that hangs over the river. Quite a different perspective when you can “drive” underneath it. 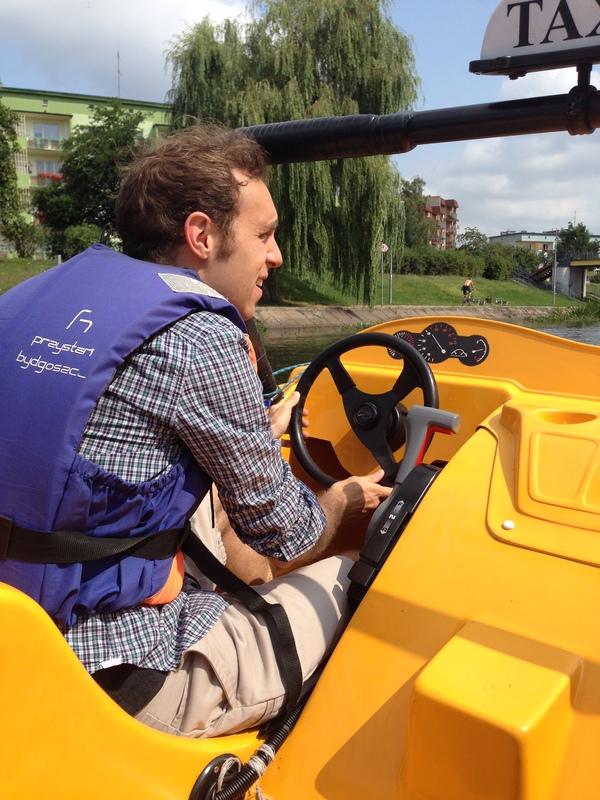 And then a few days later our nephew Drew arrived….so back to the car-boats again. The rental people at this point were probably thinking “what crazy Americans” because we have now been there three times within a week. We eyeballed a sporty red car. And the brown one behind it? 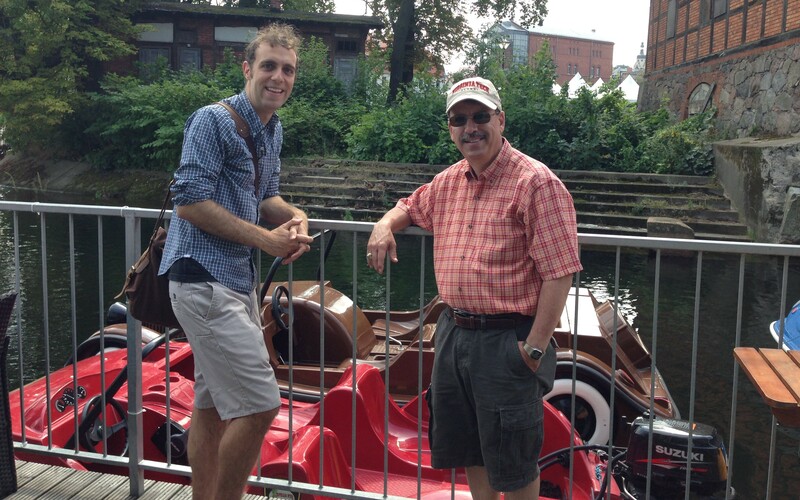 That’s the paddle-car we took out the first time. But this time we settled for a yellow taxi. Well, this little car had more speed than the blue police car….so we zipped right along on the river and made it even further upstream before we had to turn around and go back. David and Drew took turns driving while I waved at people like a queen riding in her carriage. Each time we saw different sights along the way. 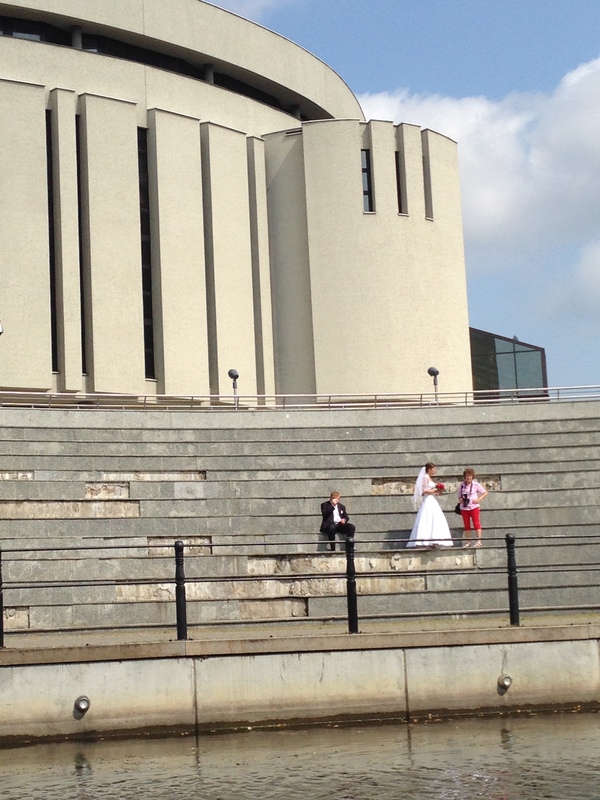 A bride and groom taking pictures on the steps of the Opera Nova. Poor guy was sweating bullets. 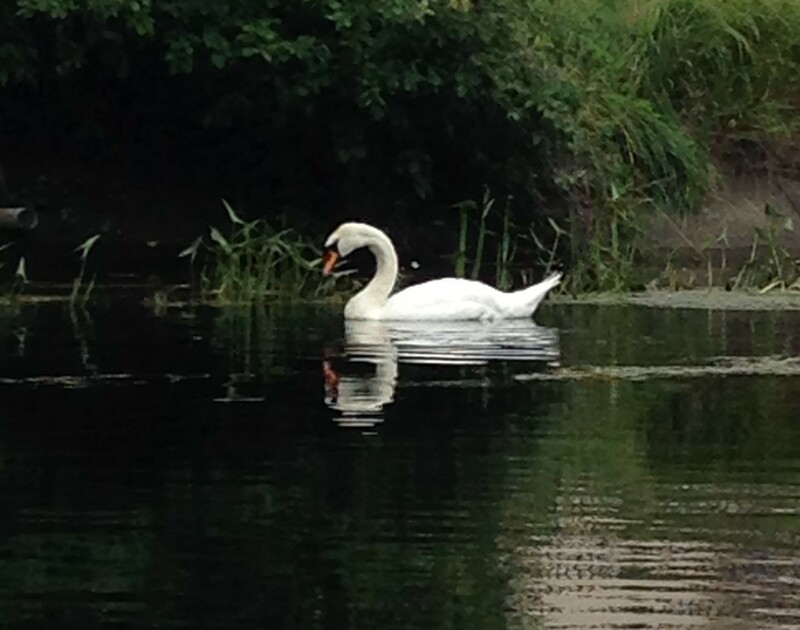 A beautiful swan enjoying a leisurely paddle on the river. The reflection of the buildings in the still water. 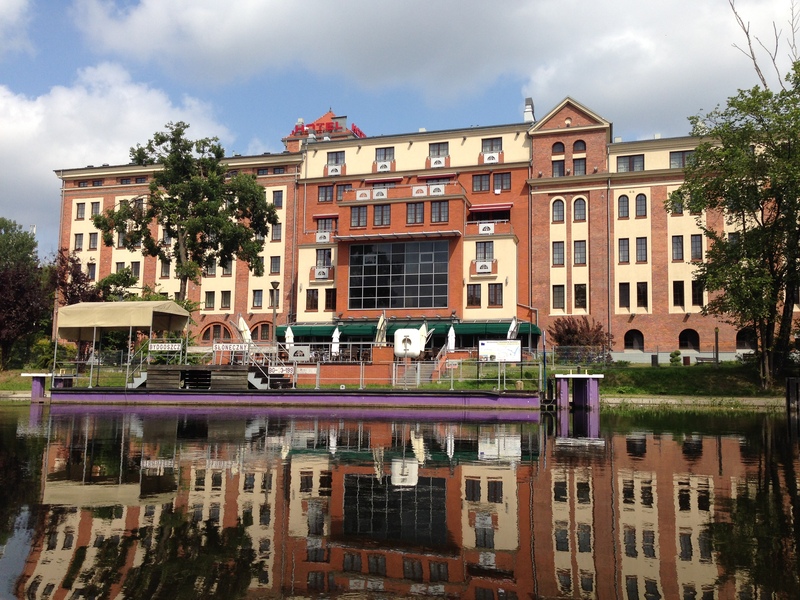 A barge turned restaurant. See our wake – we were moving along! 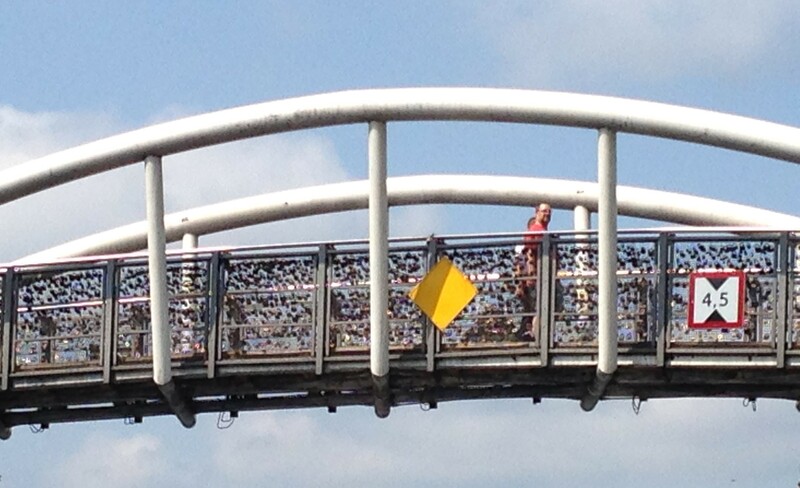 Going under the Love Lock Bridge. And in case you were wondering, it wasn’t that expensive. You can rent the car-boats for either a half hour or an hour. We chose the hour all three times. 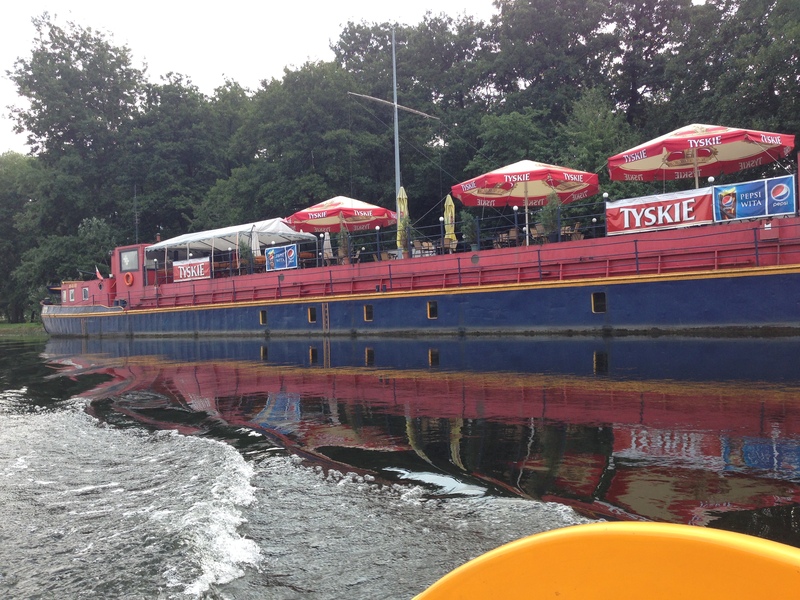 The paddle car-boat was 50 zloty (a little over $13.00), while the motorized car-boats were 85 zloty (about $22.50). Not a bad deal for a fun hour on the river! You guys are having so much fun! Well, we still aren’t sure how long we will be here so trying to do as much as possible. And yes we are enjoying it!